Did you hear about the Pillsbury Bake-Off yet? Or do you remember past ones? Sue Compton won last time with her mini ice cream cookie cups and Carolyn Gurtz was in '08 with her double-delight peanut butter cookies. She got a million dollar grand prize....for peanut butter cookies. Gah! Those better be some amazing cookies, ya know? Hehe. Anyway, to kick off this year's competition, Pillsbury sending out prize packs like above. I got one myself and the next is for you. Who wouldn't want some Pillsbury doughboy products for free? Hoo-hoo! If you plan on entering a recipe into the bakeoff, you have until April 18th to perfect it, so you better get to cooking. 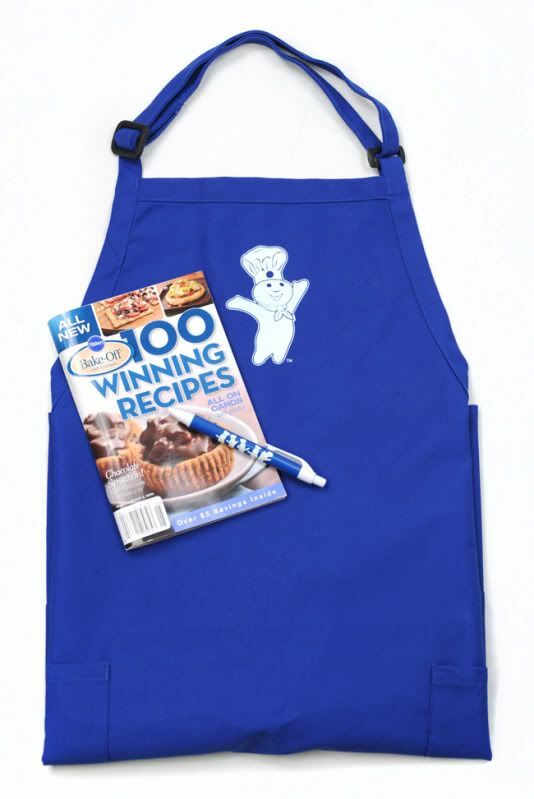 But while you wait for the oven to preheat, here are some ways to win your own apron, pen, and book (and boy are there some drool-worthy recipes in there, yum). Required entry: Comment below. Tell me what you think the winning recipe this year will be....more cookies? muffins? a stunning entree this time? ~Giveaway ends at midnight EST March 13th, 2011. All information and prize packages have been provided by Pillsbury and MyBlogSpark. Good luck! If only I know how to bake, I would definitely join in. Even if I don't win, I would still enjoy that contest and I think that is the most important part of the contest. I already subscribe to QJ via google reader.. I think it will definately be a dessert this year! Yumm! That sounds like a cool giveaway and I have no clue what will come up this year but I think it will be a little more special than a cookie, Cupcakes have become big this year as well. Good luck to the contestants. It will be a dessert. Thats all people want to see anyway. Cookies!! Maybe cupcakes but probably cookies cuz everybody likes them. I subscribed to your site. I subscribed to the cooking one, too. I'm guessing some sort of "healthy" entree, something lighter than usual. An entree would be nice. I think it will be some type of dessert that will win, cupcakes are very popular right now. I would love to have the 7-inch Domo Qee Skeleton. It will be a cookie. The winner should be something that contains chocolate! I think an entree will win this year. I'd like to see an entree win. I think it'll be some kind of comfort food like chicken and dumplings. It'll be a dessert...desserts make me smile.. I think it will be a dinner entree. It will definitely be a dessert. I subscribed to Quirky Cookery. I think the winning entry will have Pillsbury Pizza dough in it! I love the baking suit^^ My mom is a good baker her specialty is fruit cake just sharing, Thanks!